The 9th International GEM&L Workshop. Language in Global Management and Business: Theoretical, Methodological and Empirical Advances. 10-12 June 2015 at Aalto University, School of Business, and Hanken School of Economics, Helsinki, Finland. 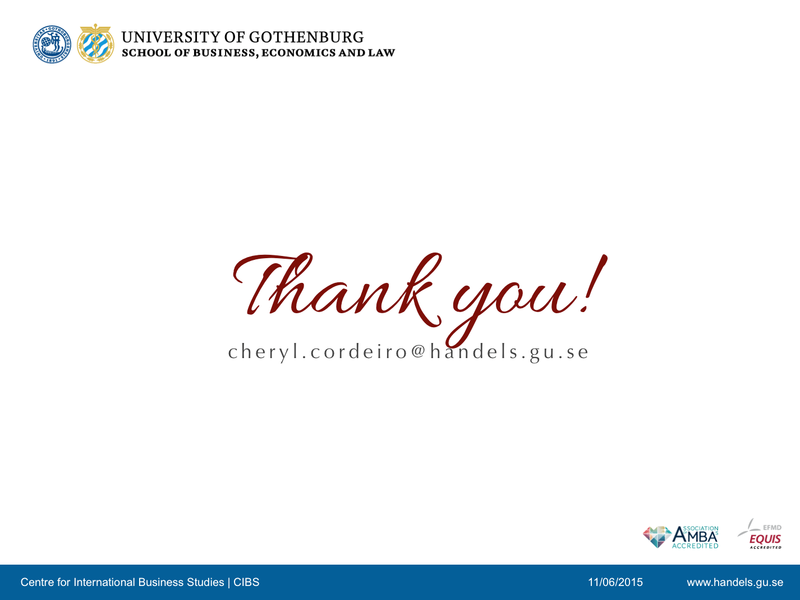 Hi everyone, my name is Cheryl Cordeiro and I’m a Research Fellow at the Centre for International Business Studies at the University of Gothenburg in Sweden. 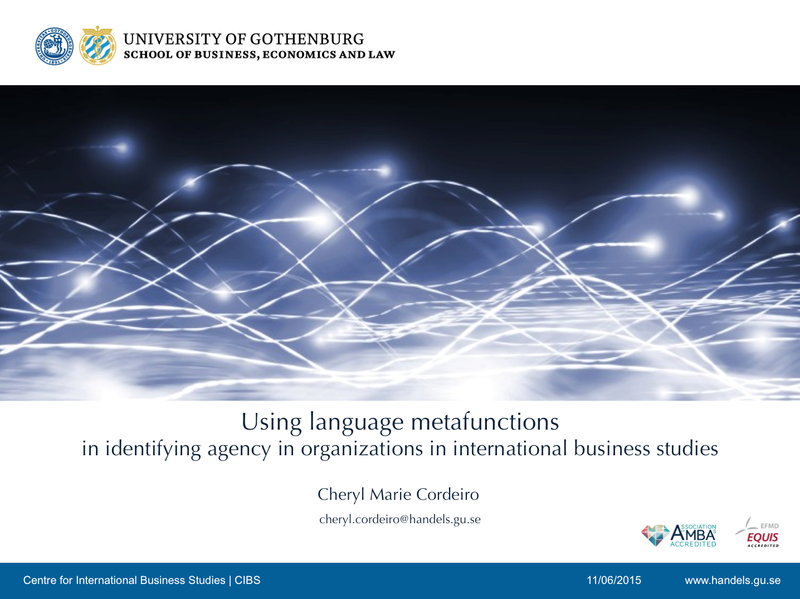 I’ll be spending the next twenty minutes or so talking about how language metafunctions can be used as a tool for identifying agency in organizations. My academic background is in applied linguistics, specifically that of applying discourse analysis unto the field of international business studies. The conceptual framework I’ve used for this study then is not new to the field of linguistics or discourse analysis, it is however quite new when applied to the contextual studies of organizations in terms of the use of language metafunctions. Language metafunctions refers to the underlying infrastructure of the system of language meaning making in order that people understand each other in everyday talk. 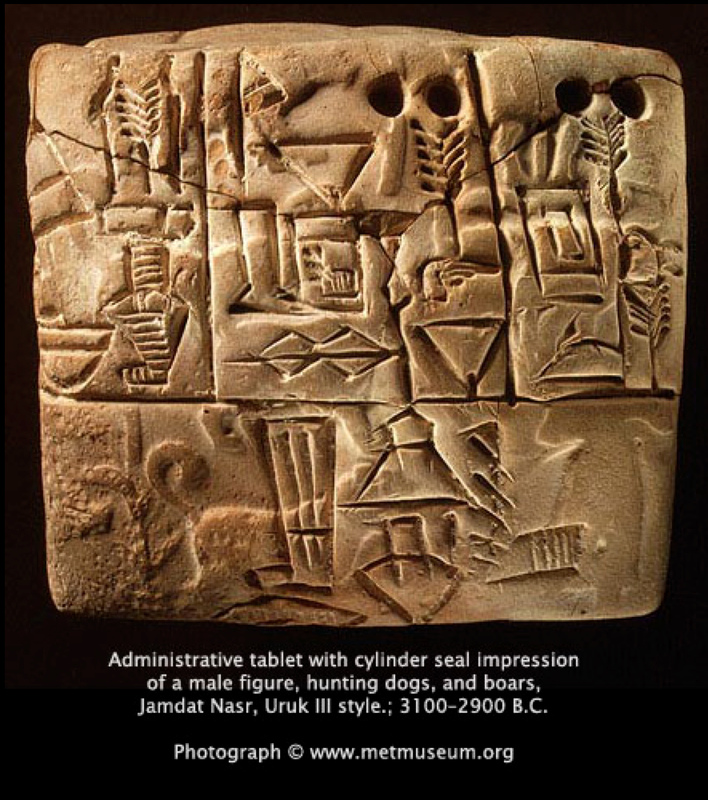 The insight that human social organisation is based almost entirely on the use of meanings goes as far back the foregrounding use of signs in Mesopotamian divinatory tablets from the third millennium BC. But why is this important? And how is that related to organization studies today? Well, it was from these initial administrative tablets that humans as a species inherited a scheme of inferential reasoning that allowed us to conclude certain facts from a system of language. 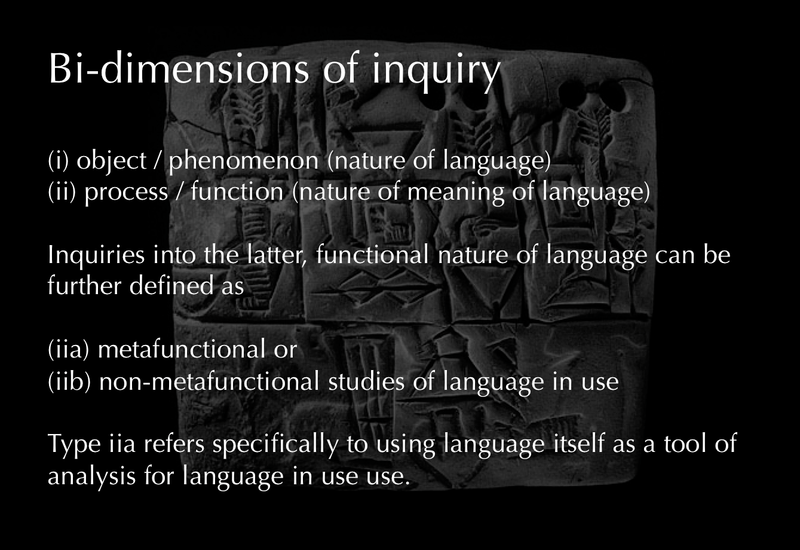 Modern language has from this historical context inherited its broad bi-dimensions of inquiry. In terms of language studies, it means that language can be studied as an (i) object or phenomenon, which refers to the nature of language and its characteristics, and it can be studied as a (ii) process or a function, which refers to the nature of the meaning of language in use. The study of the metafunctional aspects of language, which is that you view language in its infrastructural dimension, and the non-metafunctional aspects, which is what is reflected of the infrastructural dimensions of language, how ideology is built for example. In this study, the term ‘functional grammar’ is used conceptually to distinguish it from a formal grammar, based on the perspective that language has evolved to satisfy human needs and it is organized in its functions in relation to these needs. Language is not arbitrary. Everything about language can be explained by reference to how language is used. The academic scholar who has devoted most time in the study of language in its functional aspects and a functional grammar is Michael Halliday, whose works began to take prominence in the 1970s, under the field of study called systemic functional linguistics (SFL). 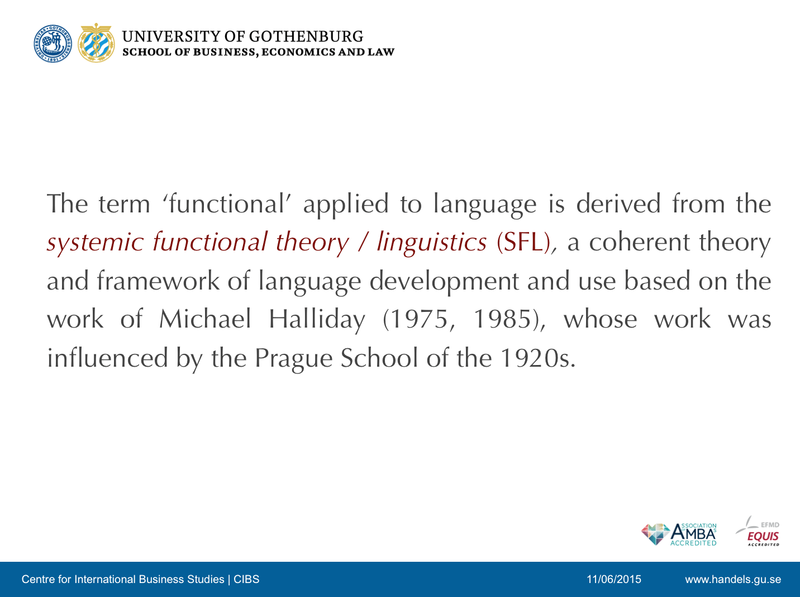 Why use systemic functional linguistics as theory and framework in the study of language? It offers a different perspective to language in use and its grammatical construct. Traditionally, language has been thought of as a medium for expressing thoughts or reality. 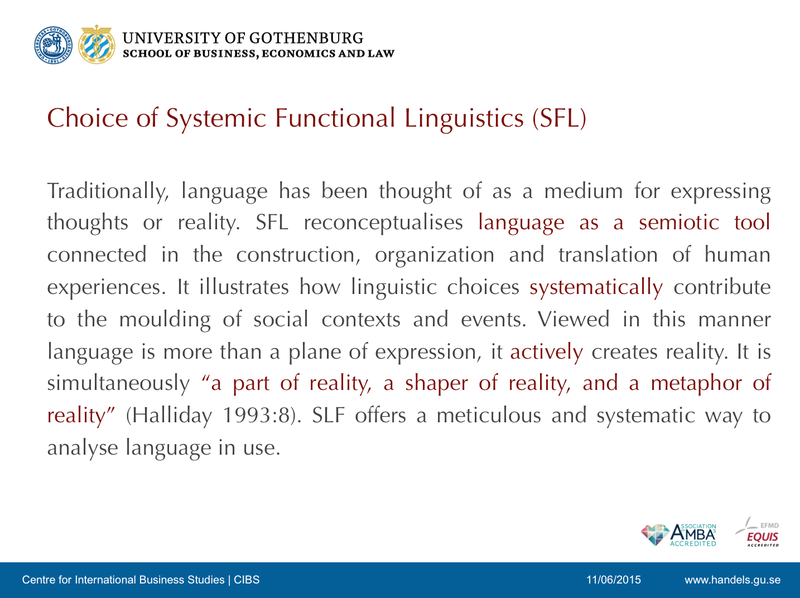 SFL reconceptualises language as a semiotic tool connected in the construction, organization and translation of human experiences. It illustrates how linguistic choices systematically contribute to the moulding of social contexts and events. Viewed in this manner, language is seen as more than a plane of expression. It’s a human entity that actively creates reality. Language is simultaneously “a part of reality, a shaper of reality, and a metaphor of reality”. Because SFL is the study of functional grammar, as a tool and method of analysis, SFL offers a meticulous and systematic way to analyse language in use. 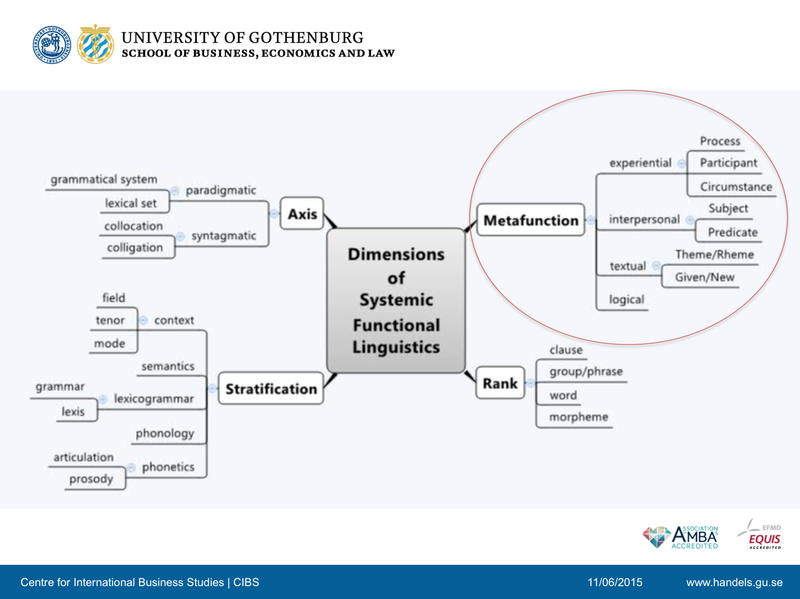 This diagram offers an overview of the various dimensions of SFL as grammatical system that takes you from lexical items or words to clauses or sentences, to how these can be studied for various purposes. In this paper, I’ve focused only on the metafunctional dimensions of SFL, which are manifest in three types, the experiential (ideational), the interpersonal and the textual. These three layers of meanings are manifest in all clauses at one time. 1. What are the metafunctionso of language as defined by SFL? 2. 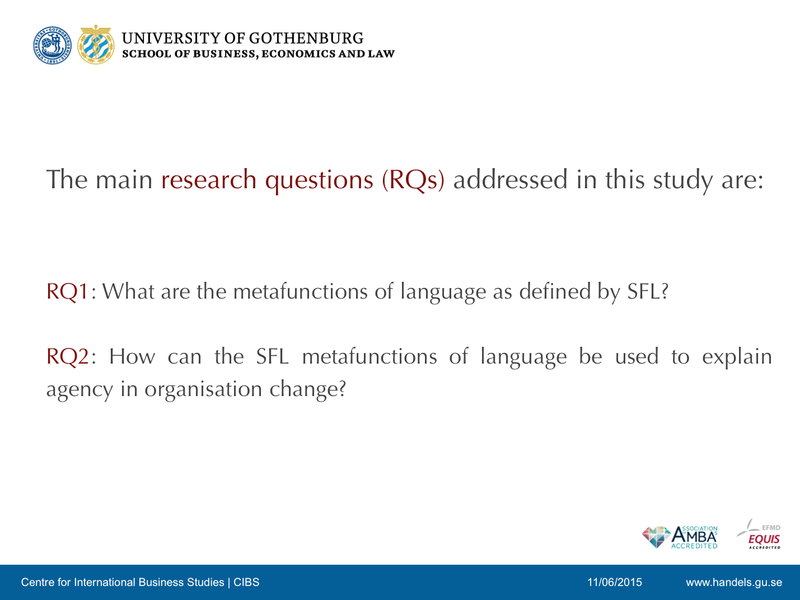 How can the SFL metafunctions of language be used to explain agency in organisation change? Text Example 1 is an example of how the nominal type element which is the Subject and the verbal type element, which is the Finite, can be used to uncover active or passive agents in language construct. 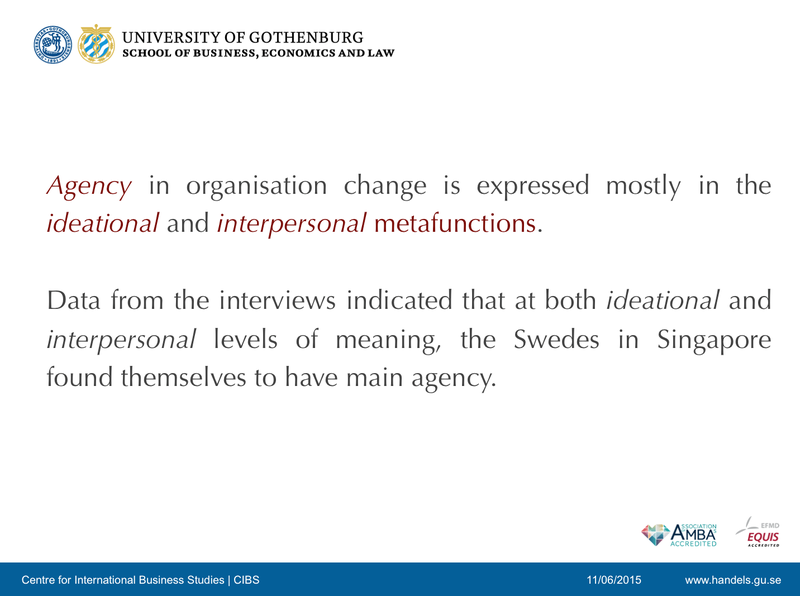 This abstract is taken from an interview with a Swedish manager working in Singapore. It was one of twenty three interviews, and she was talking about how she transformed the organizational structure and culture in the Swedish subsidiary in Singapore. She was outlining how she saw herself as culture carrier, what her responsibilities as managing director was, and the challenges she as well as her colleagues faced during the process of organization transformation. 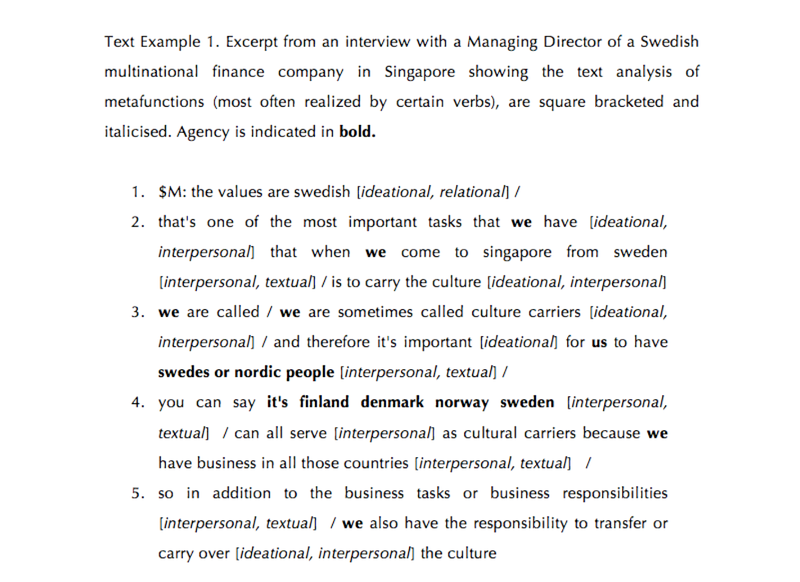 From this interview, doing a metafunctional analysis, you’ll find a clear indication of her identification with the Scandinavian culture. That she took it upon her role as managing director to make changes in the organization, both formally and informally. So she re-wrote the organization handbook, she took away the vertical hierarchy of the organization, and she implemented new communication processes, basically encouraging to seek out colleagues for help and for knowledge, and to encourage employees to take on greater responsibility. So she saw herself as a change catalyst. But once the transformation process began, then she saw that others followed her lead and they became agents of change. But this was observed far later than from the beginning. She said it took about three years. But what is interesting is going back to how language in international business studies can encompass more than it being studied as an object and a phenomenon. 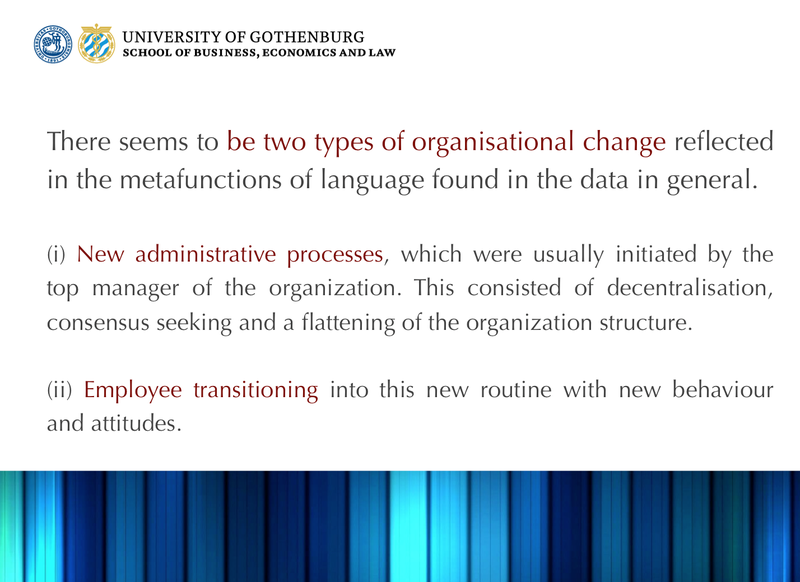 It can be studied as a process and it can also be used as a tool to study other organizational phenomena. The 21st International Robot Exhibition (iREX 2015) NEDO Robot Forum, Tokyo. The 21st International Robot Exhibition (iREX 2015) Robot Summit, Tokyo.